I was looking for the worlds simplest barbecue sauce recipe. I found the one below. It actually isn't bad, it's got a strong flavor but it is specifically called a "Table Sauce". This is the stuff you see in a squeeze bottle that you pour over your barbecue in a restaurant or a picnic table. 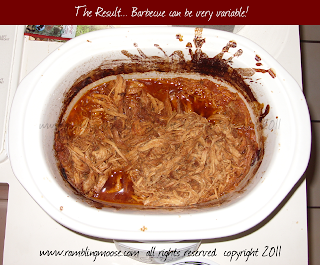 This isn't the stuff you put in the pot to cook your pulled pork. It was too watery for that. To really get the right flavor for your meal, you would want to use 1/2 of this sauce in the crock pot, and reduce the rest of the sauce to a "catsup like consistency". I wanted no cook, I got no cook. It didn't mean that it would be right to put 4 pounds of pork in a crock pot, add the sauce below, and walk away. That's what I did. The pork was... acceptable but wasn't exceptional. Then again, it's an Emeril Recipe. I've found Emeril's recipes to be "Not For Me". Either too spicy or too salty or like this not quite right for what I was doing. That's my mistake. The recipe I have below I will save, but I will also remember to keep it on the table, not on the pork. Notice the last sentence? Dress the sandwiches to taste? I didn't do that. My Fault, and I will Eat My Mistake. After all it came out "acceptable". You can see the pot before I pressed go. So beautiful and so much promise. First of all, add 4 pounds of Pork to your crock pot. I sliced it down the middle just to make it more manageable. I added the sauce which in reality was twice as much as I needed for the actual cooking. Then I covered it all up and allowed it to marinade overnight. No real reason, just my preference. 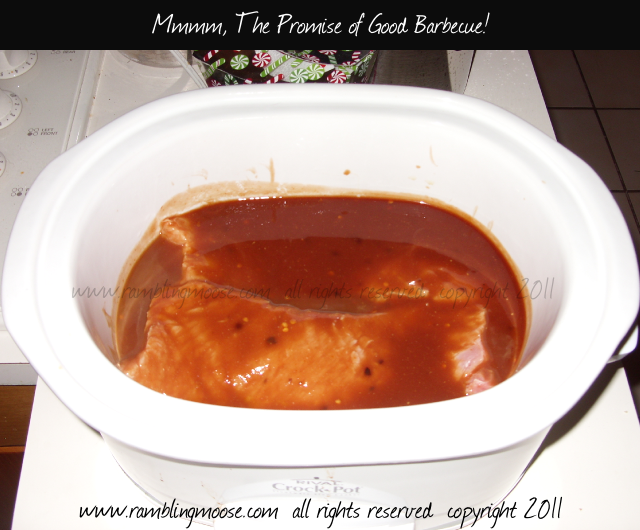 The next morning, 6AM to be exact, I put the crock in the heater and pressed Low and 10 Hours on the crock pot. I would say that was about 2 hours too long. It is my first time cooking a batch of Pulled Pork this way. Remember, cooking in one of those crock pots is supposed to be fool proof, but this fool got in the way. A strong hint is to put the meat in the pot, then starting around hour 4, flip it every half hour or so and test the temperature and texture. 160F seems to be the happy temperature for pork, you may want to research it since lately I've seen as low as 140F for a roast or chops. I did have this last night for dinner. It went well with my home made rolls. Definitely worth the effort but technique is what got in the way. Hey, I'm not a professional chef, but I could play one on TV! Remember, Table Sauce for the table, you will want something a bit thicker for the crock pot since the meats will cook in their own juices. For the vegetarians in my family like my Godmother up in Wellington, I'd be interested in trying this with some Tofu and vegetables. It would make an interesting Vegetarian stew.